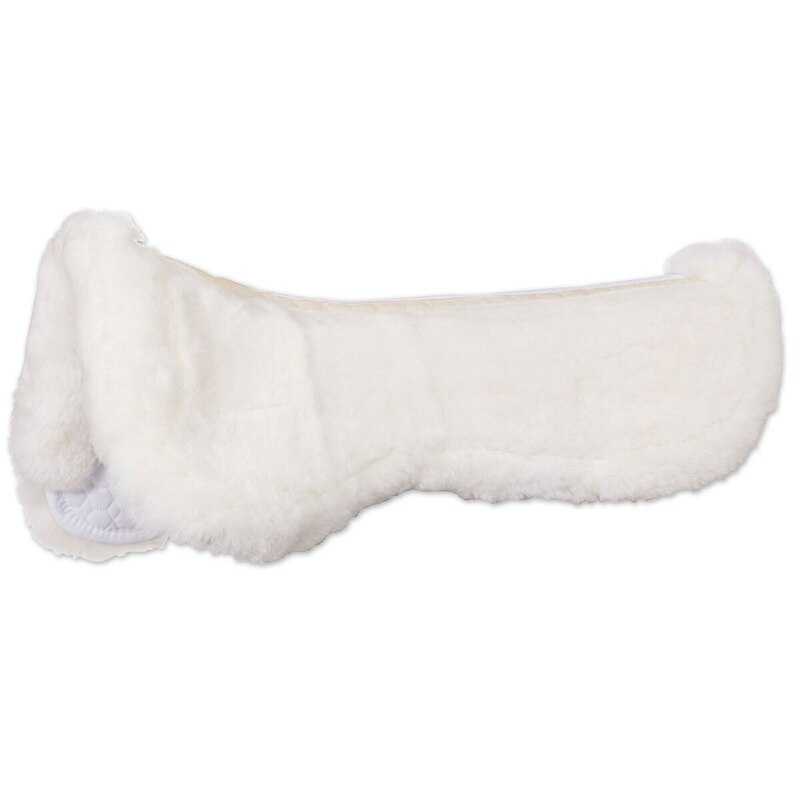 The Mattes Sheepskin Correction Pad system is ideal for horses that are either out of shape/from or returning from an injury, where incremental correction may be needed as the horse’s back and shoulders gain muscle tone. It is also good for one-sided horses or as a rear or front riser. Unique design of the Mattes Sheepskin Correction Pad incorporates four pockets along the spine - two front pockets and two rear pockets. Shims (12 included) fit into these pockets for a completely custom fit. You can shim the pad in one pocket, or in all four pockets, depending on the need of each particular horse. As the horse gains muscle you can eliminate the shims one by one to give him room to muscle up into the saddle. 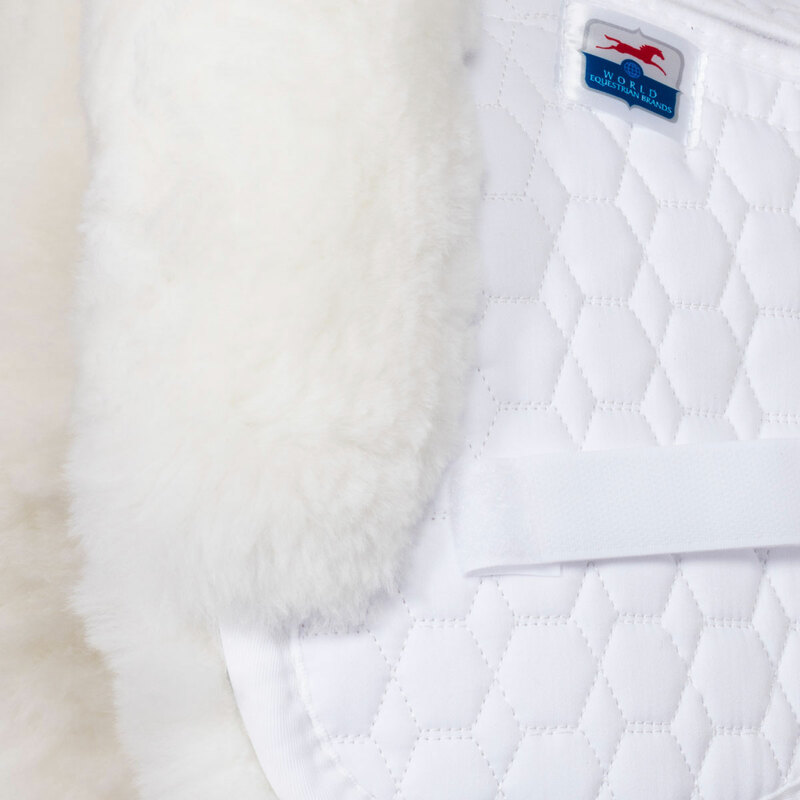 This half pad has a heavy-duty outer cotton quilt, with the patented Mattes stitching pattern. Dressage in White, Black or Custom Colors. Special Features Correction Shims Included. Form fitting to reduce pressure points and distribute the rider's weight evenly. Mattes Sheepskin Correction Half Pad with Pockets for Shims- Dressage is rated 4.8 out of 5 by 17. Rated 5 out of 5 by VTG1 from Great product! I have needed a half pad for a while and tried many before I bought the Mattes. I am very happy with my purchase and compared to everything else I tried it is so much better in terms of fit and quality. My only regret is I am using it to school my horse and wish I had bought it in black. Rated 5 out of 5 by Knightrider from Great construction The pad has really helped with saddle fit. I have a short backed horse and he is hard to fit. Rated 5 out of 5 by hmfarm from Excellent quality I am still trying to get my adjustments right for my filly (her saddle slips to the right) but this pad offers so many options I am hoping to find the correct balance with it. 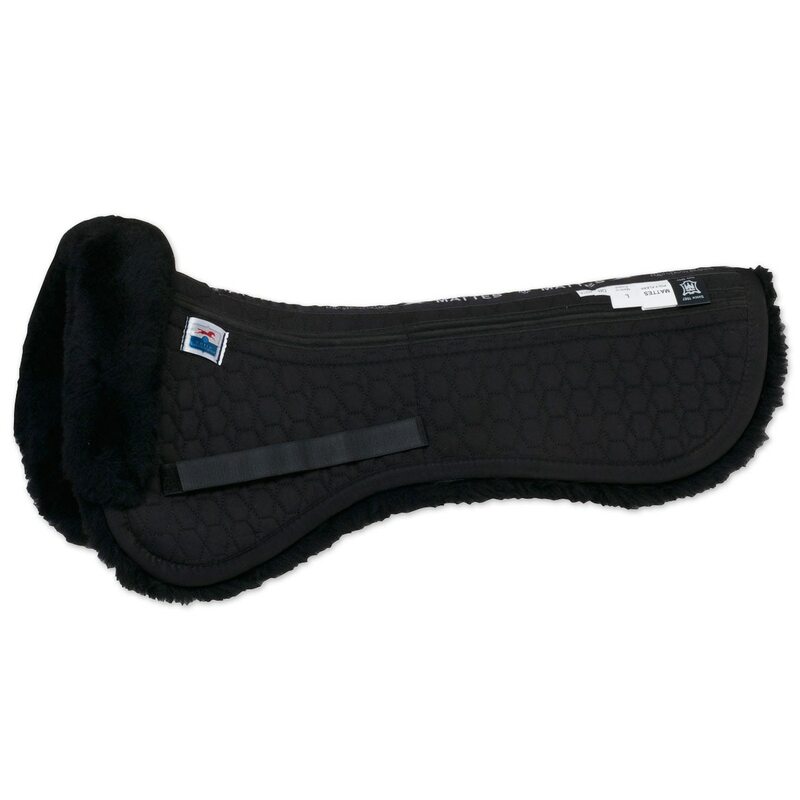 Rated 5 out of 5 by ginspeachy from Great quality and functionality I noticed an immediate difference in my horse the first time I used this pad. My horse moves a lot freer. Before I was using a foam riser pad to balance my saddle. The Mattes pad balances my saddle much better and looks a lot nicer. I am so happy I decided to invest in this product for my girl! Rated 5 out of 5 by Niki from Wonderful pad! I purchased a new dressage saddle and needed a little something for the front and this pad was perfect. I love that it came with 6 front and 6 rear inserts to customize the fit for your horse. The pad does seem a little long and sticks out past my saddle pad a little bit but the amount it sticks out depends on which dressage saddle pad I am using. Of course I may have purchased too long a pad as I have an 18" saddle so I ordered the large pad. It is such nice quality I don't want it to get dirty sitting past my saddle pad and collecting hair. Mattes is quality product so I know this pad is well worth the investment. I may order a second pad in some fun colors for riding around the farm in and then I can use the other one I ordered for show only. Rated 5 out of 5 by Cookie523 from I am still using the first pad I ever bought which was over 6 year ago. The pad still looks almost brand new. Almost no wear of the materials. The fleece is still as thick and fluffy as when I bought it. It fits my saddle great. 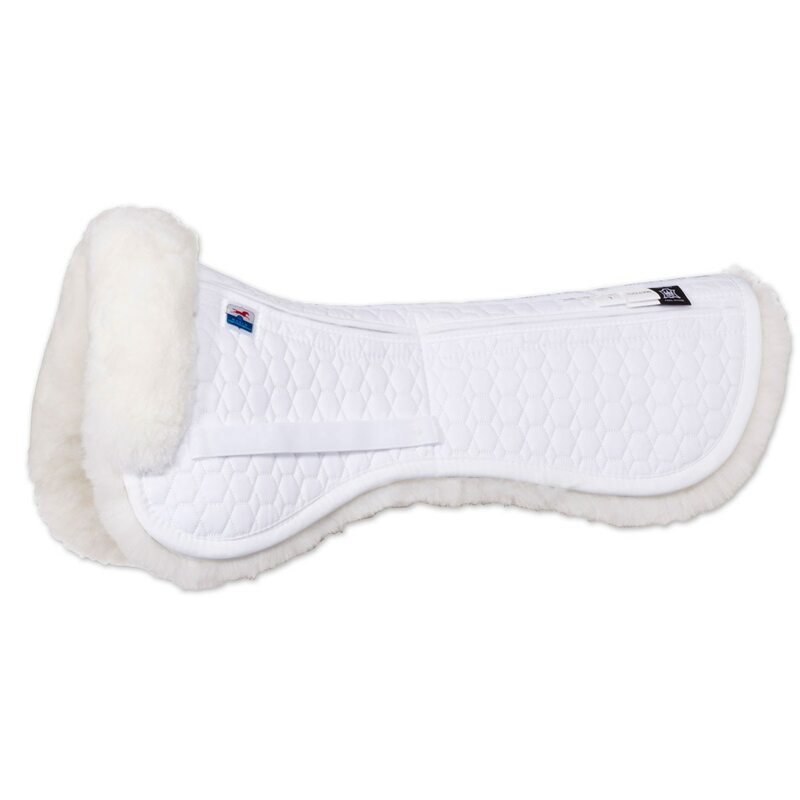 All the horses I have used this pad on have loved it. This saddle pad has seen hundreds of hours of wear. I will definitely replace it if I ever have to. Rated 3 out of 5 by ridethrough from new not as good as old The older models are much thicker in the sheepskin. Sadly i had to return this as it was not as effective as the one i was borrowing. Rated 5 out of 5 by TooManyCritters from The Mattes correction half pad work very well at alleviating pressure points under the saddle. i just wish they weren't so expensive! Rated 5 out of 5 by Centares from Excellent purchase! This pad helps tremendously if you have a developing horse and you aren't ready to spring for "the wonder saddle" just yet. 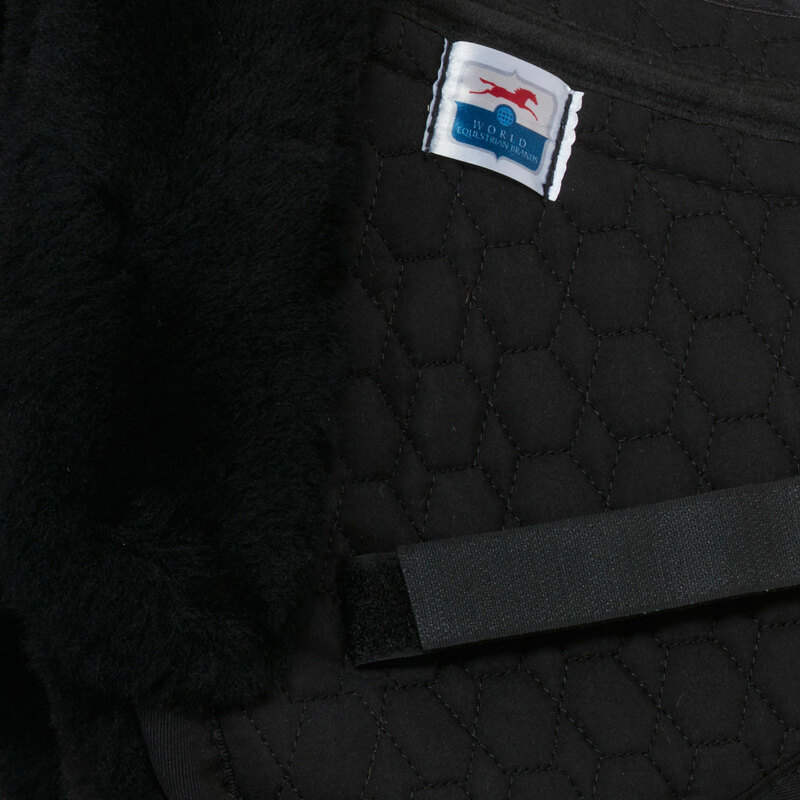 The shims in the pad allow you to adjust your saddle fit and keep your horse comfortable. Rated 5 out of 5 by MrMRM from Gorgeous pad. A bit expensive for a half-pad but a very nice product. The half-pad is absolute German perfection but the price in American dollars is a bit steep. SmartPak has the best price.